Email marketers have to send a lot of emails everyday. It is impossible to make it manually. The same is not impossible to make a good targeted email marketing campaign without using proper software. 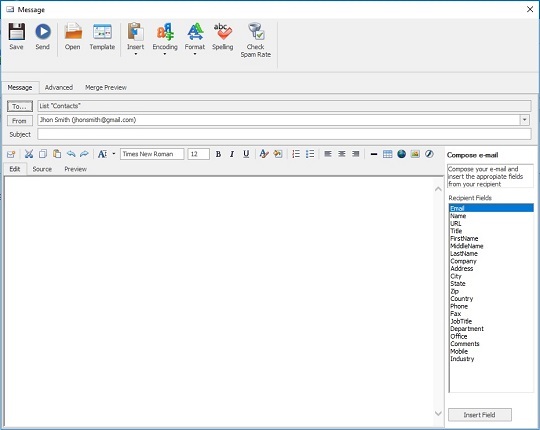 There are a lot of different mailing software that helps email marketers organize the process of targeting and mailing the messages to the subscribers. You can find Bulk Mailer on our site - shareware mailing software that will help you create a successful email marketing campaign. BBulk Mailer is able to send huge volumes of email messages to a lot of recipients. And it won't take a lot of time, because the process of mailing is fast. At the same time you can create special personalized messages with the help of this program. A build in HTML Editor (with Flash, images and attachments support) will make your message distinguish from all other emails in subscriber's Inbox. Sending emails messages designed in both HTML and text-only formats is also possible with Bulk Mailer. This software guaranties every recipient will understand the whole message and won't see weird signs instead the message, because the Bulk Mailer obtains a full support for international characters. In just few seconds you can resegment you emailing list and retarget the whole email marketing campaign. One of key features the Bulk Mailer has is protection of undeliverable email due to direct mode check of email addresses before sending any emails. After your emails will be sent you automatically will get a detailed report, which you can use to improve your email campaign if needed.